Sometimes, the key to better transportation options isn’t transportation. New provincial legislation and updates to the Greenbelt and Growth Plans may help pave the way to more walkable, bikeable, and transit-supportive communities. When we think of transformative changes in transportation, we might imagine solid things like trains, more frequent buses, bike lanes, or multi-use trails. But in addition to infrastructure or transportation routes, land use planning and growth management can have a profound impact on how we’re able to get around. 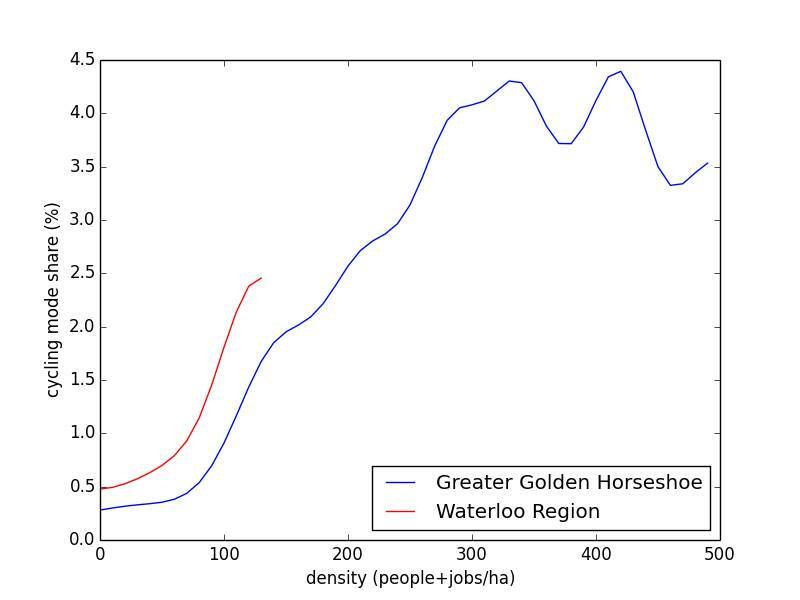 Cycling mode share vs density in Waterloo Region and the Greater Golden Horseshoe. As density increases, the percentage of people who bike increases by an order of magnitude. Data source: 2011 Transportation for Tomorrow Survey, Data Management Group. It’s not hard to see why. If the places where you live, work, shop, or go to school are all closer to each other, you’re more likely to choose to walk or bike between them. Likewise, if there are more people coming and going from a particular place, it’s more likely that more frequent transit can be sustained in that area, which in turn makes transit a more attractive choice. If the densest areas in your city or region lie along a line, then transit can become very attractive for trips along that line. 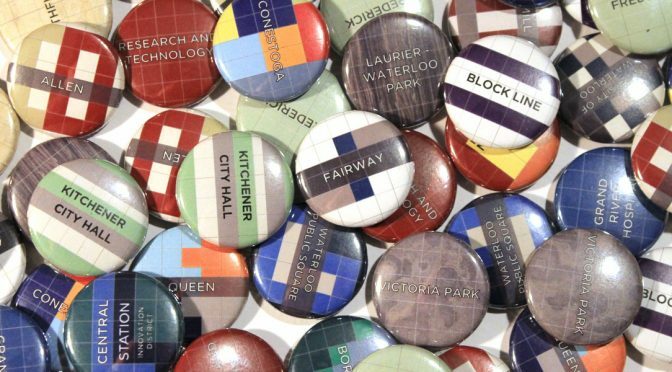 Waterloo Region has led the province in growth management and land use planning – the province relied heavily on the expertise of the Region in developing the Growth Plan for the Greater Golden Horseshoe. We have a higher target than most nearby municipalities for intensification – that is, the rate of development that takes place on previously developed land as opposed to building over farmland or natural areas (‘greenfields’). In building light rail along the central transit corridor to attract development, we’ve also aligned our transportation planning with our desired land uses. Our Official Plan was challenged by greenfield developers at the Ontario Municipal Board (OMB), which threw our community-supported plans for growth into question for a time. Last week, the Smart Growth for Our Communities Act was passed in the Ontario legislature, making amendments to the Planning Act and the Development Charges Act. Some of these changes limits the ability for Official Plans to be challenged at the OMB, which will help to protect our municipalities’ ability to guide development in ways that encourage greater walking, cycling, and transit use. The rules around what municipalities can charge developers for infrastructure to service new construction, called development charges or DCs, are also changing. Previously, the Region could only charge 90% of the cost of new transit infrastructure (e.g. new buses, shelters, facilities, etc.) to developers, now they will be able to charge for the full amount associated with new developments. On top of this, the way in which this amount is calculated is changing from being based on a ten year historical demand average to a ten year forward-looking projection of demand based on planned development. This means that as the Region plans for increased transit ridership, it can charge based on what level of service it plans to provide in the future, not on what it provided in the past. It also means that the Region can apply DC funds towards new services, like extensions of light rail into Cambridge. As Brent Toderian says, the best transportation plan is a great land use plan. Let’s hope Ontario takes these words to heart when guiding our municipalities in how they grow.